WASHINGTON D.C. -- President Barack Obama said Tuesday he was deeply disturbed by the "vulgar and divisive rhetoric" directed at women and minorities as well as the violence in the 2016 presidential campaign, a swipe at Republican front-runner Donald Trump. Without mentioning the GOP candidate by name, Obama used a unity luncheon at the Capitol to express his concern with the political discourse and the protests that have escalated to attacks at the Trump rallies. The candidate has spoken of barring Muslims and deporting immigrants living here illegally. Obama received a standing ovation at the conclusion of his remarks assailing the tenor of the campaign and pleading for civility. "We have heard vulgar and divisive rhetoric aimed at women and minorities, and Americans that don't look like us or pray like us or vote like we do," Obama said. "We have seen misguided attempts to shut down that speech however offensive it may be. He said that while some may bear more of the blame for the climate, everyone bears responsibility for reversing it. Trump's political rivals and others blame him for sowing division, rather than unity, across the country. Trump says he's done no such thing and calls himself a "uniter." Protesters forced Trump to cancel a rally in Chicago on Friday. "It is a cycle that is not an accurate reflection of America. It has to stop," Obama said. "And I say that not as a matter of political correctness, it's about the way that corrosive behavior can undermine our democracy, and our society." "In America there aren't laws that say we have to be nice to each other ... But there are norms, there are customs, there are values that our parents taught us and that we try to teach to our children," the president said. 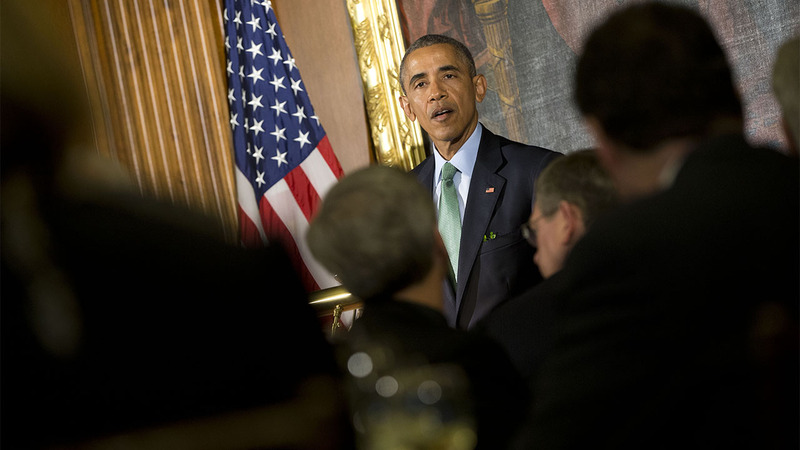 Obama spoke at a St. Patrick's Day luncheon at the Capitol.